The "Albums" tab on the left shows a list of your music albums. Those are the albums you added into Musicnizer by title, from files and folders, from Audio CDs, or by scanning barcodes. 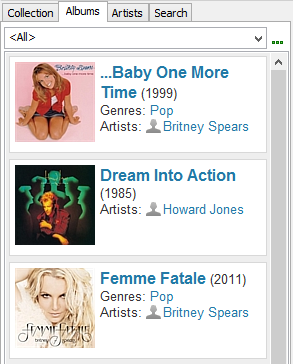 Albums can be displayed as a detailed list (default) and as album covers. Use this menu to control how your albums are sorted on the "Albums" tab. Additionally, this list can be filtered. Similar sorting options are available for search results on the "Search" tab. 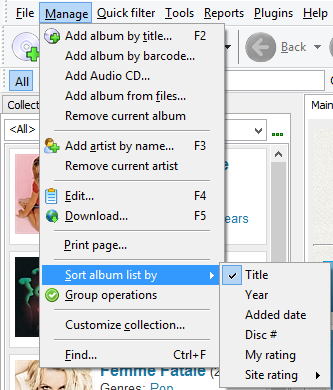 If you need to sort your albums by a field that is not available in this menu, just switch to the "Collection" tab. There you can create your own sorting rules.